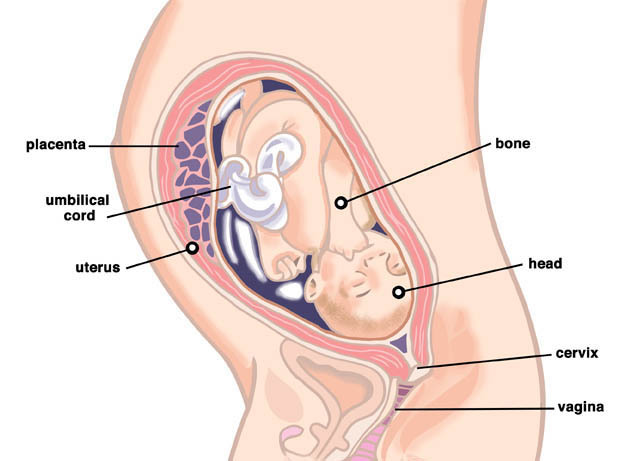 During this stage in pregnancy, the average length and weight of a healthy baby starts to vary more between each individual pregnancy. However, we will continue to look at typical measurements. This week you could expect the baby to be up to 43cm in length (crown to heel). The average length of a baby born at full term is between 48 and 52cm, meaning that your little one is not far off his or her birth length. However, they currently weigh about 1.1kg and they have a lot to gain in this department as the average newborn at full term weighs between 2.8 and 4.2 kilos. By now the baby will have some colour in their eyes, but this is not necessarily an indicator of their future eye colour. When he or she is born they are likely to have slate blue eyes if they are Caucasian, and dark grey or brown if they are African or Asian. Mixed race babies can be born with a range of eye colours. However, usually within around 3 months of birth they eyes will have changed in colour and the long awaited answer to 'What colour eyes will they have?' will be evident! The list of unwanted side effects may seem never-ending, but you are in the final trimester of your pregnancy now and you will probably find that the time goes quickly, so don't dwell on these problems too much. Once you have your baby in your arms these worries will be a very distant memory. In the meantime, if you have found that your skin on your abdomen has become bumpy, especially along any stretch marks that you have developed, then rest assured that this is normal in many pregnancies. It could also occur on your thighs, buttocks or arms. Neither the itchiness, nor the bumps, are dangerous, but they can be very annoying. If it becomes very irritating, your GP may be able to prescribe an ointment or antihistamine to ease it. Remember that your skin is even more sensitive than usual during pregnancy, so if you are experiencing skin irritations, steer clear of perfumed cosmetics and opt for hypo-allergenic bath oils and moisturisers instead. It is quite likely that you have a bigger appetite at the moment, brought about by your baby's growth spurt in the final trimester. It is generally thought that by this stage in pregnancy you probably need to aim to consume around 200 calories more than usual, but don't get the take-away menu out just yet as that actually only equates to one large banana or one packet of crisps! Tiredness, or even boredom can contribute to those sugar cravings, but remember, while nobody would suggest that you abstain from the odd chocolate treat, it is still very important that you are consuming nutritious foods. Try thinking of everything that you consume as something that is consumed by your baby too. Sugary foods and drinks are often effectively 'empty calories', so try to make sure you get your energy from foods that also provide you and the baby with important nutrients. You need to ensure that you are still getting plenty of calcium, iron, folic acid and vitamin C, as well as protein. Swap the crisps for some nuts and berries, (there are some tasty combinations available in supermarkets and health food shops) and when you are choosing your sandwich go for wholemeal bread with a filling containing salad or vegetables. In general, the energy boost you get from eating these foods will be more gradual and long-lasting than that obtained from junk food. Page generated in 1.42 seconds.